Wonderfull work my frien! 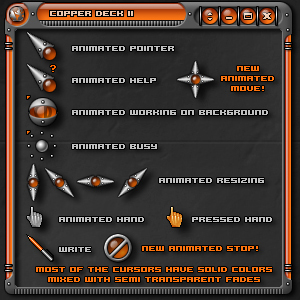 finally a set of cursors! Fantastic set of cursors. Your imagination is amazing. Incredible! One of the best cursor themes I've seen! WOW simply Wow! Great set of cursors! Great job! I love them, they are easy to work with and not too distracting like some other cursors. Magnificent thats all I can say. UFFFF!!!! !, I don't have words, I am impressed. Hey Treetog, Love the cursors. However, I have one tiny little nitpick. On the Text Select cursor, the one the looks like a capital I, it seems the hotspot is slighty to high. When I go to click on a line of text my cursor usually ends up on the line above the one I am trying to click on. So if you happen to be editing your cursor set could you make the hot spot more in the middle. Other than that Great job! A perfect match with the other copperdeck themed stuff. Finally a dark skin i like! Thanks!